Austerity versus spending: What will Moscow choose? Russia has more options than most of its G20 peers in choosing to either save or spend its way out of the current economic crisis. In the debate on international financial architecture, Russia, having picked up the baton in conducting G20 summits, has proposed opening discussions on a range of issues related to the management of public debts. One of the goals in this direction was the revision of the guidelines for public debt management, which were developed by the World Bank and the IMF. In particular, a proposal emerged during the discussions about taking into account, as part of the public debt, the so-called contingent liabilities (including those related to pension payments). The first results of this work will be presented in October, and the adoption of the final version is scheduled for February–March of next year. Another focus of the work was the strategy for gradual reduction of government stimulation of the economy. The G20 participants were presented with a medium-term program aimed at a gradual movement toward stabilization and improvement of state budget deficits and the volumes of public debts, which are inextricably linked with the need to take into account the detrimental effects of excessive fiscal consolidation on economic growth. According to Russian President Vladimir Putin, the G20 members, after some heated debates, came to understand the necessity of finding an optimal balance on this issue. As the situation in the eurozone has shown, the over-ambitious, budget-saving programs have led to a side effect — a worsening of the recession. At the same time, a lax approach to the problem of reducing budget deficits could undermine confidence in the markets, and, by raising the cost of borrowing, postpone the moment of entering onto a path of more sustainable economic growth. Therefore, in each case, individual strategies that will balance these two mutually exclusive interests must be maintained. Meanwhile, Putin stressed that just restoring stability to state finances is not enough for a return to high growth rates. Therefore, at the G20 Summit, Russia offered the St. Petersburg Action Plan to ensure economic growth and job creation. The plan is based on the budgetary policies and obligations of countries to implement structural reforms that will make it possible to achieve success in initiatives undertaken in the areas of labor market regulation and taxation, human capital development, infrastructure modernization and regulation of the commodity markets. As part of the G20 Summit, Russia presented its fiscal policy, the basis of which were deficit and public debt parameters approved in the budget for 2013–2015. According to Russian Finance Minister Anton Siluanov, the St. Petersburg Action Plan includes measures for stimulating the growth of investments, which, by 2015, should provide a level of investment equal to 25 percent of the GDP and, by 2018, 27 percent of the GDP. It would hardly be correct to compare parameters of Russian state financing with other countries — even with members of the BRICS bloc, like India, Brazil and South Africa. 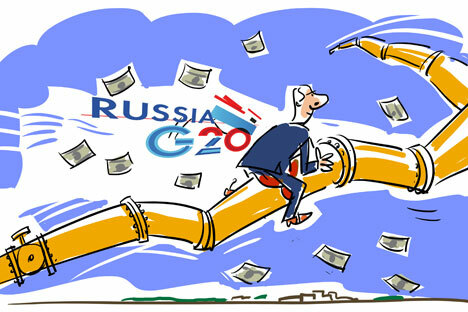 Russia, among the G20 club members, looks more favorable, due to the fact that it is the largest energy supplier to the world market. It is thus able to maintain comfortable levels of public debt to GDP and a current account surplus in its balance of payments. It is too early to say how the implementation of austerity measures adopted in Russia will pan out. The new budget rules entered into force only this year, and the slowdown in the national economy is at least partly a result of the reduction in government spending, yet other factors played a more significant role. Pavel Vasiliadi is Director of the Analytics and Risk Management Department at the UFS Investment Company.